"SS-20" redirects here. For other uses, see SS-20 (disambiguation). The RSD-10 Pioneer (Russian: ракета средней дальности (РСД) «Пионер» tr. : raketa sredney dalnosti (RSD) "Pioner"; English: Medium-Range Missile "Pioneer") was an intermediate-range ballistic missile with a nuclear warhead, deployed by the Soviet Union from 1976 to 1988. It carried GRAU designation 15Ж45 (15Zh45). Its NATO reporting name was SS-20 Saber. Its deployment was a major cause of NATO's 'Double-Track Decision', which led to the deployment of more medium-range nuclear weapons in Western Europe. The RSD-10 was withdrawn from service under the 1987 Intermediate-Range Nuclear Forces Treaty. 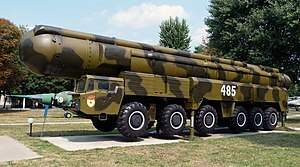 The missile used a MAZ-547A/MAZ-7916 transporter erector launcher produced in the Belarusian SSR by the Minsk Automobile Plant. The TEL was originally designed for the RT-21 Temp 2S intercontinental ballistic missile. On August 10, 1979 testing of the modernized "Pioneer"-UTTKh (15Zh53) began at the Kapustin Yar test site. It continued through 14 August 1980, and on 17 December 1980 the missile designated as SS-20 Mod3 was deployed. This variant had the same propulsion system as earlier versions, but due to upgrading of a command structure and instrumentation-service unit it was possible to improve accuracy (CEP) from 550 to 450 meters, to increase maximum range by 10%, and to increase the area covered by the warheads. This latest RSD-10 variant subsequently received NATO reporting name SS-28 Saber 2. It was intended to replace, or augment, the R-12 Dvina (SS-4 Sandal) and R-14 Chusovaya (SS-5 Skean) missiles deployed from 1958 and 1961 respectively in the USSR and Warsaw Pact states. It entered the development stage in 1966 and a design concept was approved in 1968 with the task given to the Moscow Institute of Thermal Technology and Alexander Nadiradze, who also developed the RT-21 Temp 2S in the same period. Flight testing began in 1974 and deployment commenced on 11 March 1976, with the first supplied units becoming operational in August of that year. Up to 1986, a total of 48 launch sites including a site at Pavschino, were equipped with 405 RSD-10 missiles under control of the Strategic Rocket Forces. While the Warsaw Pact arguably enjoyed a massive conventional superiority over NATO in Central Europe, Soviet leaders assumed that NATO would use tactical nuclear weapons to stop a massive Warsaw Pact offensive. The RSD-10 provided the Soviet Union with an in-theater "selective" targeting capability that it previously had lacked. The RSD-10 had the capacity to destroy all NATO bases and installations with negligible warning. Thus, the Soviet Union acquired the capability to neutralise NATO's tactical nuclear forces with surgical nuclear strikes. In 1979 NATO decided to deploy US Pershing II and BGM-109G Ground Launched Cruise Missile missiles in Western Europe in attempt to counter the RSD-10. In 1979, when the NATO decision was taken, the Soviet Union had 14 (1 operational) SS-20 launch sites. 654 missiles were built in total. These and the 499 associated mobile launchers were destroyed by May 1991 in accordance with the Intermediate-Range Nuclear Forces Treaty. Fifteen SS-20, eight BGM-109G Gryphon and seven Pershing II missiles were preserved to commemorate this agreement. One RSD-10 can be seen in the grounds of the Museum of the Great Patriotic War, Kiev, one at the Ukraine Air Force Museum in Vinnytsia, Ukraine, and another is inside the Smithsonian National Air and Space Museum at Washington, D.C..
North Korea has acquired an unknown number of demilitarized SS-20 transporter erector launchers from Russia or from Belarus for use with the BM25 Musudan missile. ^ a b c d e f g h i j k Cant, James (2005). "The SS-20 Missile – Why Were You Pointing at Me?". In Erickson, Ljubica; Erickson, Mark (eds.). Russia: War, Peace and Diplomacy. London: Weidenfeld & Nicolson. pp. 240–253. ISBN 978-0-297-84913-1. ^ "RT-21M / SS-20 SABRE - Russian / Soviet Nuclear Forces". Retrieved 23 December 2014. ^ "INF Theater / Operational Missiles - Russian / Soviet Nuclear Forces". Retrieved 23 December 2014. ^ "RSD-10 Mod 1/-Mod 2 (SS-20)". Missile Threat. Archived from the original on 28 August 2016. Retrieved 23 December 2014. ^ Nick Hansen (4 May 2012). "North Korea's New Long-Range Missile – Fact or Fiction". 38 North. Retrieved 12 April 2013. ^ Michael Holm, 23rd Guards Missile Division, accessed July 2013. Wikimedia Commons has media related to RSD-10 Pioneer.